It is no surprise with Hideo Kojima; but Death Stranding is just as unique as it is difficult to understand. What is certain is that its game world will leave no one indifferent and that we can't wait to figure out what this title is all about. French actress Léa Seydoux joins Norman Reedus and Mads Mikkelsen in the cast and she seems about as mysterious as the other characters. Update: Added an image gallery. Update 2: Watermark-free video added. At first I was thinking: no way this can run on a PS4. But then I looked closer, and it seems to be all vertical slices where you have no control over the camera. You can see it in every scene that the camera is not being controlled. So, this is a big advantage for better visuals as it's not a 360 view they have to be able to render, just a slice. this sounds like utter tosh. still a super intriguing game, and still beyond impressive visually. decima engine is a beast, you can see why kojima opted for it. but those many many box carrying scenes? is that like a core element of the game? being a delivery guy? 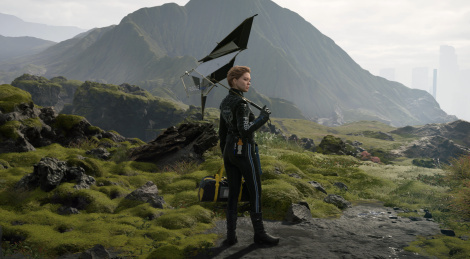 Kojima said that some of the camera angles in the trailer were just specially chosen for cinematic effect. The camera in all the gameplay scenes is fully controllable. I think the question is - how much of this is a game and how much of it is an interactive movie like Detroit Become Human. It looks such bland game, I was nearly falling a sleep last night watching this! Compare this to TLOU 2 which looked incredible Kojima has got a hell of alot to do in the next year or two! that's the key thing to take away from this. this game is upwards of 2 years away! what we saw of this looked stunning, but they're clearly still pretty early in content development. seems they've purely been focusing on rendering and character movement so far. Visually great, but this was the most boring trailer of the game so far. We still have yet to see a lot of other stuff, so the wait could be worth it at the end. Hmmm, I wonder how many more big name celebrities are going to be involved with this game. Kojima and his esoteric trailers, you gotta love'em. Really liked this trailer, only thing I thought it missed was combat, which I'm sure they're waiting for TGA, PSX, or maybe even in E3 2019. Depending on how much longer it takes, this might turn into a PS5 launch title along with PS4, of course. It's obviously using photogrammetry and physically based rendering, delivering some of the most photo real landscape visuals ever seen in a game. Others might be baffled, or even bored, by the gameplay segments of it, but to me that's the best part. It looks like this one is going to be a game that takes its time. It'll be methodical and concentrate more on world exploration and immersion. It looks different, and different to the usual Ubisoft, EA and the rest conveyor belt games that all look like the same shite in a slightly different skin. I want to see more, which is more than I can say for the rest. Most disturbing, dark, sad, hopeless atmosphere I have seen in a video game. Absolutely mindblowing. I just hope it wont focus on combat and dull crafting. Exactly. It's like a David Cronenberg/David Lynch collaboration of some sorts. Thank you so much for this version of trailer !!! For me, 4K quality and 60fps is exaggerate: my pc and ps3 doesn't support that. So... THANK YOU SO MUCH !!! These trailers make history, must be preserved in the best version and quality. And thanks to you, this is possible. Thanks again, D.
mads mikkelsen also had umbilical cords attached to his skeleton squad. there's also a recurring "wink" that appears in the trailers, including this one with the baby. it risks being overly convoluted for the sake of being convoluted... it is a kojima game after all, but it's ridiculously compelling and intriguing to watch.